When Dr. Martin Luther King, Jr. delivered the historic “I Have a Dream” speech in 1963, he spoke of a future reality. Today, thanks to his efforts and so many others, I am living that dream. No laws prevented me from enrolling in and graduating from a respected university. Although the student community was majority white, many of them demonstrated an interest in diversity and they valued me in the midst of our differences. While many people still have a picture of Mississippi that they’ve pulled right out of 1963, good things are happening here in terms of race. I attend a multi-ethnic church whose mission includes Christ-centered reconciliation across racial lines. I live in a cluster of homes that includes Black residents from the local community, international students studying at nearby colleges and universities, and white friends from near and far. Most significantly, though, I know I am living Dr. King’s dream simply because I can dream. As I write, I am in the midst of contemplating my future career options. I will soon finish a Masters in Divinity from seminary, and I will re-enter the working world. My options include everything from helping to start a church to a career in writing. As a result of Dr. King’s dream and legacy, I can let my mind roam and wander across a breadth of possibilities. Never does it enter my mind that my options might be limited because of race. But work remains to be done. Although African Americans have equal rights under the eyes of the law, as a people we have yet to enjoy the full benefits of freedom in this country. Black babies are being killed in the womb in startling numbers, black men who make it to adulthood are often snuffed out by their own brothers, and too many African American communities are stuck in a cycle of poverty, low-education, and poor health. I am not only living Dr. Kings’ dream, I have inherited its work. Our generation must make full use of the technology, information, and awareness that the 21st century has brought and bend them toward the epic struggle for justice in our own country and worldwide. The urgency of the moment persuades me to invest my time and energy into endeavors like the Reformed African American Network (RAAN) and the African American Leadership Initiative at RTS Jackson. 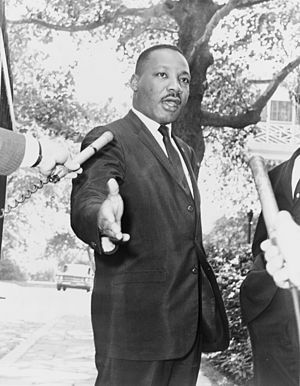 Dr. King’s dream was not articulating a destination so much as a disposition. Justice for all is not a place at which to arrive, but an ongoing pursuit of dignity for all people. So I have a dream, too. I have a dream that each member of this generation will find their cause. I have a dream that we will all be swept up in an epic movement of service for others who have fewer privileges than we do. I have a dream that Dr. King’s dream will continue to become a reality not just for African Americans, but for all God’s people. As you celebrate the day set aside to honor Dr. King and his labors, remember that the dream goes on.